In the winter months, many treatment lagoons struggle to meet regulatory requirements for ammonia since the microbes that provide nitrification slow down, and even die off, in cold conditions. Rather than building a costly mechanical plant, treatment facilities can quickly retrofit their lagoons with a BioCord™ Reactor system to significantly improve treatment performance and meet regulatory requirements for a fraction of the cost. Recently, a BioCord Reactor pilot project helped a small town in Ohio improve cold weather nitrification in its wastewater treatment lagoons. The system was installed in September 2017 and monitored until the pilot project was completed in June 2018. During the pilot project, the ammonia concentrations in the influent ranged from 20 mg/L to 40 mg/L. Bishop Water designed this pilot system for a much smaller loading rate, since there was little to no initial data before the project began. Even with this limitation, the BioCord Reactor system was able to consistently reduce ammonia to below 5 mg/L. The project ran throughout the winter, seeing wastewater temperatures as low as 1˚C. Another BioCord Reactor pilot project in a small town in southern Alberta began in the spring of 2018. Most systems start treatment in the summer so that the warm water will encourage growth of the nitrifying bacteria. 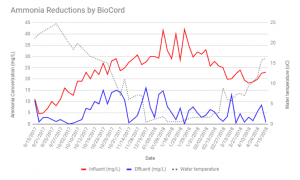 In this instance, the wastewater system was struggling to achieve sufficient nitrification in the spring and needed to start looking at options early. April and May in Alberta saw many days and nights where air temperatures dropped below 0˚C. Even with these low air temperatures, the system still experienced improvements in ammonia removal and effluent quality. The BioCord Reactor was able to consistently remove ammonia levels from as high as 50 mg/L in the influent to below 10 mg/L, and often to 0 mg/L. The BioCord Reactors allow superior cold weather ammonia removal. This is due to the open-frame design that ensures good circulation. Densely looped polymer fibres, which hang on the modular frames, provide a massive surface area. This surface provides aerobic and anaerobic microorganisms plenty of room to grow. In turn, this growing bacteria helps treatment lagoons maintain regulatory compliance for ammonia in cold weather conditions. The BioCord Reactors also incorporate fine-bubble tubing. This high pressure aeration inhibits clogging that can occur in other air diffusers due to sludge and debris build-up. The powerful aeration underneath the frames also keeps water moving around them. This inhibits ice from forming over and around the frames. Learn more about Bishop Water’s cold weather ammonia removal pilot project in Ohio. Contact us to learn more about our pilot projects.